If summer in Australia means anything, it’s that people are likely to be going out in droves to buy an air conditioner to escape the heat. Before the slog of Christmas festivities and vegging out in front of the telly watching cricket or tennis, it can pay to know exactly what type of air conditioner you want before you head to the shops. A lot of us want the latest and greatest, and a smart air conditioner may fit the bill. So, what is a smart air conditioner, and where can you get one? Read on to find out. 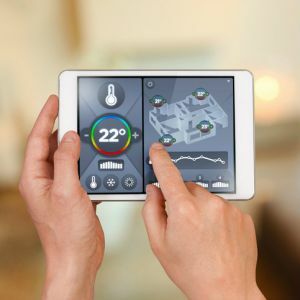 Smart air conditioners are air conditioners that are connected to the internet and are thereby controllable through your smartphone, both inside your home and outside. It’s just one of the many appliances to join the ‘Internet of things’ – appliances connected to the internet for maximum controllability and convenience. Why ferret around for that air con remote stuck down the back of the couch, when you can just pick up your smartphone and fine-tune any and all settings on your air conditioner? Smart air conditioners afford you that luxury, and it’s an exciting step forward. What can smart air conditioners do? Think of it like a remote thermostat. If it’s a stifling-hot day, the last thing you want to do is come home to a hotbox of a house. With remote controllability through your smartphone, you can press a few buttons while still in the office or your workplace, and come home to an adequately-chilled home fine-tuned to your exact specifications. Not only this, if you forget to turn the air con off before leaving the house, you can just fire up your smartphone and turn it off to prevent nasty electricity bills. So now that you’ve got the basics, you might be interested to see what brands offer smart air conditioners – there are a lot out there! What brands make smart air conditioners? Generally, companies put most of their time and effort into developing split system air conditioners. Not only does this result in split systems being – most of the time – the best option for the house, but it also makes split systems the best bet for having a smart air conditioner. With the great range out there, chances are there’s one that’s right for you. 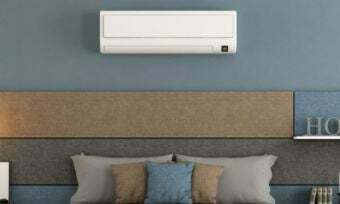 The latest range of Fujitsu General Lifestyle wall mounted air-conditioning units have built-in wireless LAN interface, allowing users to control their air con remotely. Its FGLair app enables users to view or change the temperature, fan speed and louvre position for multiple units. It also lets you check the individual operating mode of each unit, view individual room temperatures and set up two weekly timers, plus turn units on or off. One of its models with wi-fi connectivity is a 2.5kW unit (ASTG09KMCB), pictured. Some of its key features include louvres, which are claimed to help direct airflow evenly throughout a room, a human Sensor stated to adjust the performance when someone enters or leaves a room and a Sleep mode designed to change temperature gradually over time. It runs at 40 decibels, which is as quiet as a birds call. It retails at $1,639 but can be found for less than that. LG has a range of split system air conditioners and many come with the optional add-on of making them Wi-Fi-ready. This is, of course, going to mean an extra cost but it’s still an exciting proposition nonetheless. This adds to LG’s suite of ‘Internet of things’ appliances like TVs and fridges. A particular standout model of smart air conditioner by LG is the 8.0kW (P28AWN-14) system, pictured. It has a behemoth cooling capability and runs at a quiet 47 decibels. It also features active energy control, ‘Plasmaster’ ioniser and a micro-protection filter, so you have efficient yet safe, cool air to see you through the summer. It retails for close to $3,000 and we envision it’ll be more for the Wi-Fi function. So it’s no lackadaisical system and it’ll cost you a fair chunk of change. Mitsubishi Electric arguably has the most impressive and comprehensive system of the lot. Its Wi-Fi control system promises control over the whole house, all through one intuitive app available through the App Store or Google Play. If you have a ducted system or multiple split systems in the one home, you can individually control separate rooms all at once and while out and about. So if precious little Sally likes her room temperature set at 22°C, and your wife Barbara prefers the master suite set at 24°C, you can all do it through the app while at work and time it perfectly so it’s cool when you get home. And if little Jimmy loves messing around with stuff he shouldn’t, then you shan’t worry about a thermostat as the thermostat sits in your pocket by way of your smartphone! With the Wi-Fi control, you can even adjust the direction of the cooling, among many other impressive features. If this is tickling your fancy, Mitsubishi Electric has a range of air conditioners with the Wi-Fi control as an optional extra. Take for example the 5.0kW unit (MSZGL50VGDKIT), costing around $2,000. It packs in a cooling capacity enough for a fairly large lounge room or similar, and is still whisper quiet at 49 decibels. It also boasts an ‘i-Save’ mode that remembers your preferred settings and provides steady cooling to help keep energy bills consistent. 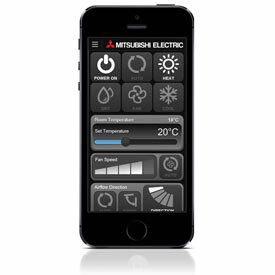 Mitsubishi Electric has a well-developed app to connect its air conditioners to the Internet. Samsung has also come to the game of smart air conditioners. While little pricing information is known about these units, we suspect there will be little available for less than $2,000. The smart air cons come under the name ‘Boracay’. They are available in 2.5kW, 3.5kW, 5.0kW, 6.8kW and 8.0kW power capacities. Its wide-intake design means it can draw more air in, which means more efficient cool air coming out. 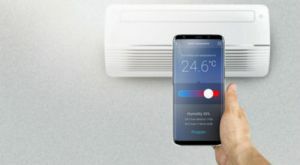 Samsung is one of the largest electronics companies in the world, and it’s fitting that the company has extended its technological prowess to air conditioners. Is a smart air conditioner worth the money? The short answer is – it varies. One thing’s for sure, though, is that you’ll be paying a premium for a smart air conditioner over a regular one with a standard remote control. Expect to pay about $2,000 or more for one. Granted, a lot of smart air conditioners are rather large in capacity and are suitable for a big room or lounge room. If you’re the type who wants maximum control over your air conditioner at all times, it makes sense to go for a smart air conditioner with a smartphone app. However, if you just like to put on the air conditioner while watching TV or chilling out we suspect a standard air conditioner will be sufficient – and you’ll likely save a few bucks. We also suspect that it’s a ‘you don’t know what you’re missing til it’s gone’ type deal. That is, once you go for a smart air conditioner, you might not want to go back! In that instance, we say it’s definitely worth the money. Smart air conditioners are a great addition to the ‘smart’ landscape, but be prepared to pay extra for it.